After one very successful cooperation, I was invited to review some beautiful jewelry pieces from RUINUO jewelry store again. 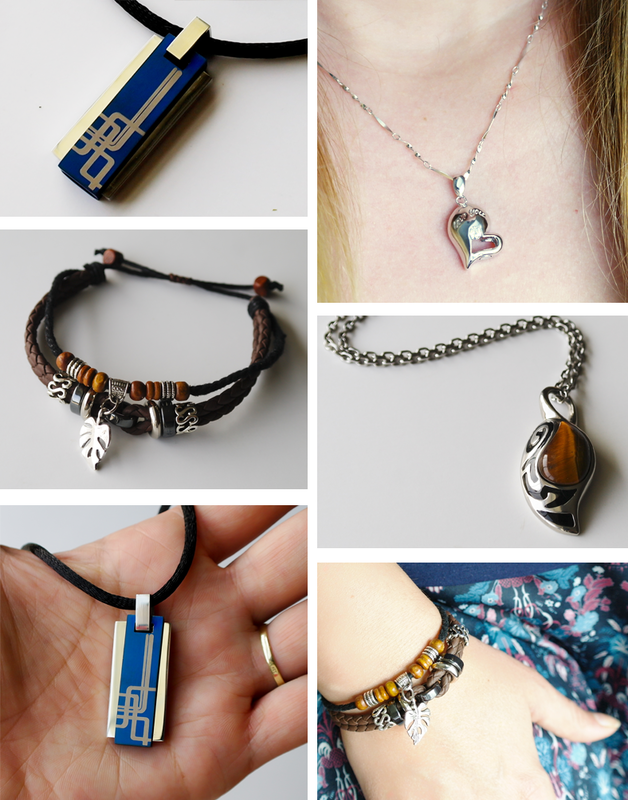 I love their jewelry pieces and accessories, they're really well made and gorgeous looking, and I couldn't be happier to work with the folks at Ruinuo one more time. So pretty, the Tiger's Eye stone is very mesmerizing. While this is men's jewelry piece, and - admittedly - it is on the larger and heavier side, I do like wearing it myself sometimes, because I've read somewhere a while ago that Tiger's Eye stone goes well with Leo zodiac (I'm a Leo). I think this could easily pass for a unisex pendant. The design is very nice.The tribal swirls on the side of it add a very cool touch, and I like the contrast between the silver, black and honey-brown colors. 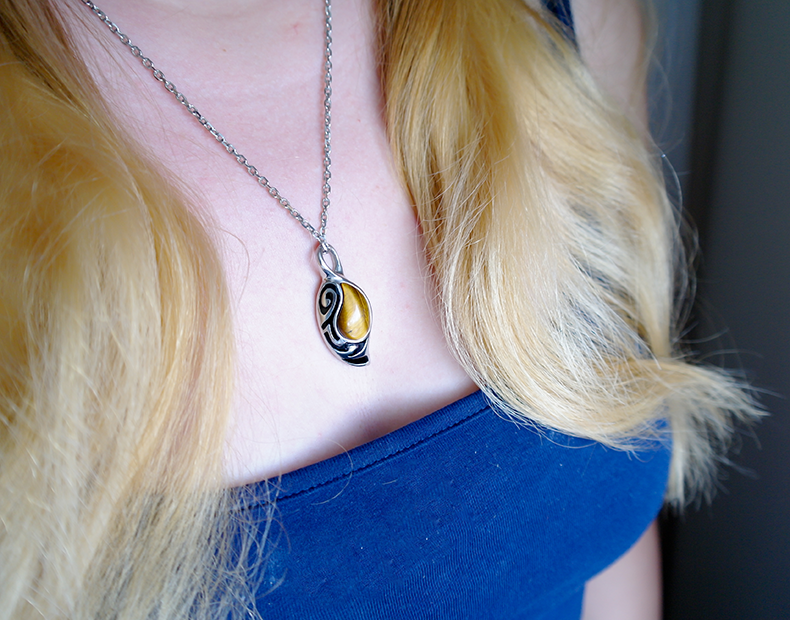 The pendant itself is a bit bulky and it does weigh a bit, but it's such a beautiful, eye-catching piece, it's really worth putting up with the extra weight. Bottom line is, I really like it. It's stylish and quite fashionable. Beautiful, so well-made and stylish - I am in love with this bracelet! It compliments many different types of looks - whether it's a paisley cami dress, crochet maxi dress or flower-power jeans + blouse - this bracelet works with all these styles and more. It's a great accessory, very chic and vintage-looking, but not too flashy or too shabby. I really love the combination of different shades of brown with the silver color of stainless steel accents. I also think the wooden beads go really nicely with the leather straps. All in all, it's just a wonderful piece; and so comfortable to wear, too. There are many similar bracelets out there, but many of them look rather cheap and aren't as durable as this one. Plus, more often than not, they come with weird loops and hooks that are tricky to put on. With this one, you just pull on the black strings to adjust the tightness. It's very easy and convenient! 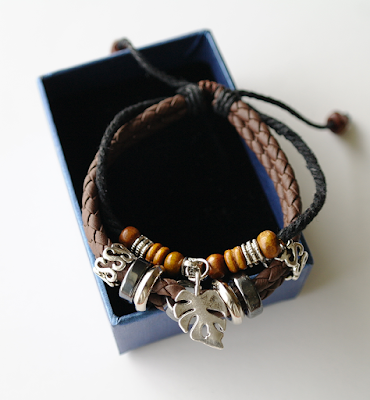 Plus, this bracelet here is made with quality material that won't wear off easily. I definitely recommend it. 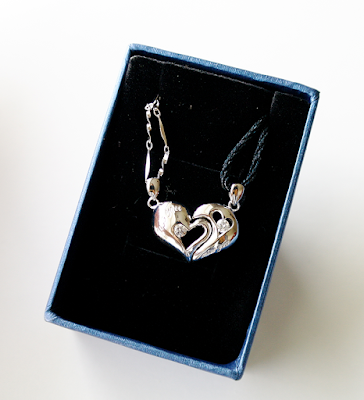 This is a gorgeous and incredibly well-designed necklace with magnetic pendants that click together to create a heart! So meaningful and full of charm! It's made out of 925 Sterling Silver with Cubic Zircon accents on both parts of the heart. 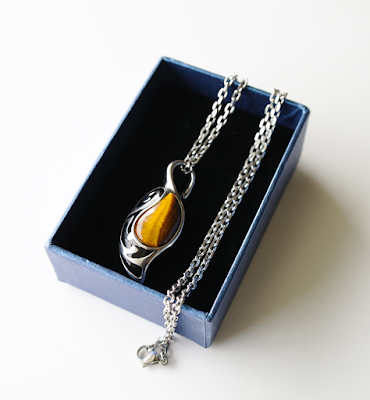 The woman's part comes with a delicate silver chain that really stands out. 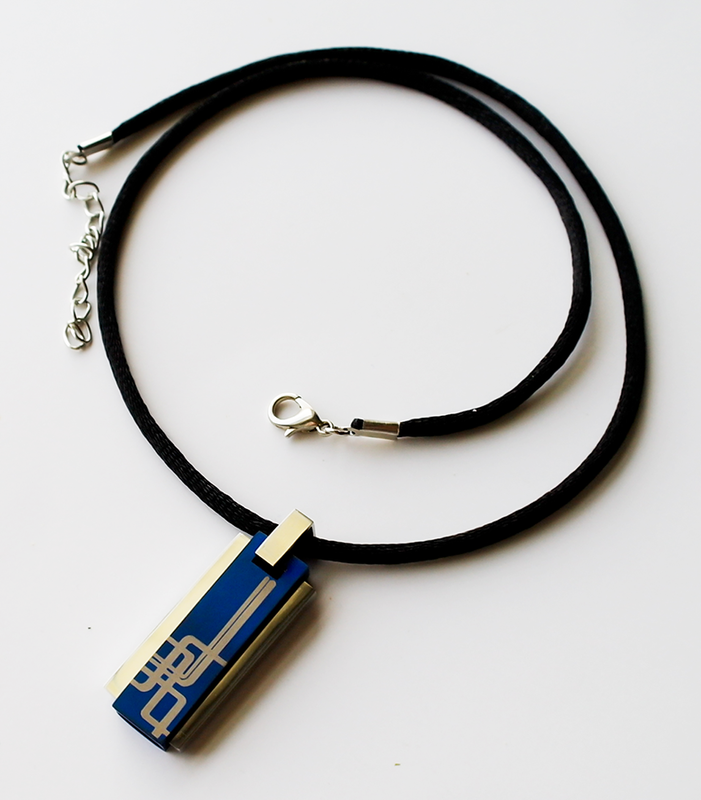 The man's part comes with a black string that contrasts with the silver pendant nicely. Both pendants are engraved - one says "Love you", the other says "Miss you". The classic look of this piece ensures it goes well with both casual and more dressy/formal looks, the silver is very bright and shiny. It's a very elegant necklace, great for a meaningful gift! Very cool stainless steel necklace that comes in two colors (blue or black) and with a choice of either a chain or simple black string. 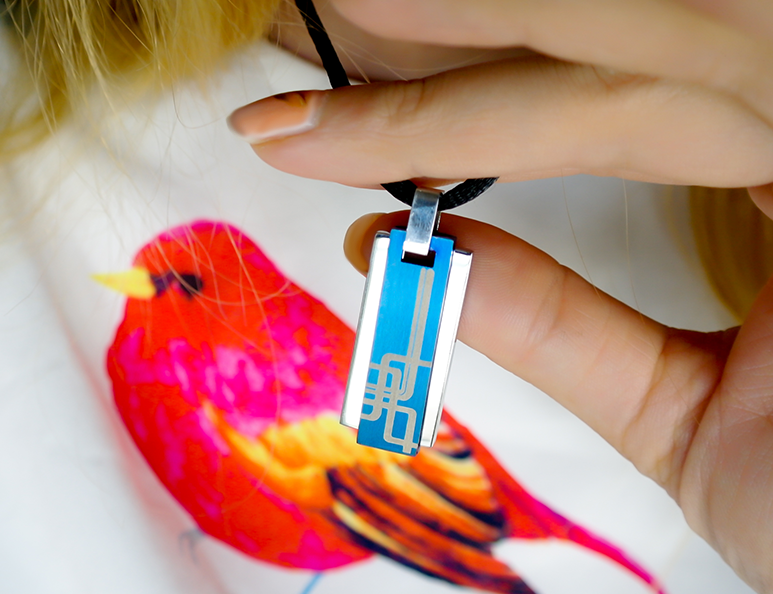 The design of the pendant is simple yet very attractive. Its symmetrical shape and minimalistic embellishment makes this a great gift for any man. This pendant is something even my husband would be glad to wear, and he is not a jewelry type of guy at all. As with other Ruinuo jewelry pieces, this necklace is very sturdy and flawless looking. It came packaged in a beautiful gift box with a blue ribbon on top, and a cleaning/polishing cloth. The chain/string length is adjustable and the necklace itself isn't too heavy, or too bulky, so you can wear it comfortably all day long. You can win $100 worth of Jewelry from Ruinuo store! How exciting is that? !